Solly on Style - My Allen Solly Video Feature | Romwe.com Leggings Giveaway | The Shopaholic Diaries - Indian Fashion, Shopping and Lifestyle Blog ! I hope you all have entered my New Year Giveaway sponsored by GoFavor.com , if not enter now by clicking HERE. I have been working on editing an Outfit Post, which has been delayed a lot as the weather has made me really lazy. Also, I get very little time to blog these days after being at office till 6pm. Ufff.. now I realllyy get time only at weekends to get pictures clicked for my outfits and share via blogposts! Anyways, I have some greatt greattt news to share! Last month I was approached by Allen Solly to get featured in their Solly on Style series. I was more than happy to be a part of the same. The first time the shoot was scheduled, I was really realllyyy excited but I was soon disappointed as the shoot was postponed! I thought of letting go the thought of featuring in a video till the day finally comes! And well straight after Christmas the shoot was planned again and was shot at PotBelly Rooftop Cafe, Shahpur Jat, New Delhi. The restaurant is a very cute, little place and a must visit for all the Delhites. I have heard they serve the most delicious Bihari food, available nowhere else in Delhi. The video has finally come out and posted at Allen Solly's Youtube Channel. Though I didn't like how I look in the video ( the camera definitely has added few pounds, also my new haircut was unmanageable during the entire shoot ), but I really liked the concept of the shoot and how well it has come out. You can have a look at the Video attached below, or visit this link - HERE. This also brings me to this Romwe Giveaway which will surely make you all happy too ! 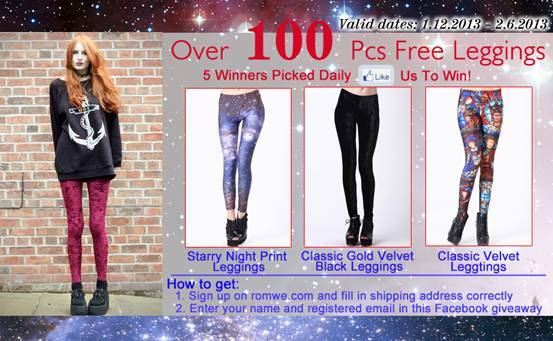 Romwe.com is having an International Giveaway and is giving away over 100 Pcs of designer leggings. NOTE: The giveaway is only valid on Romwe's Streetbelle facebook page! Click HERE to enter. So, what do you think about the video? Do share with me in the comments below!